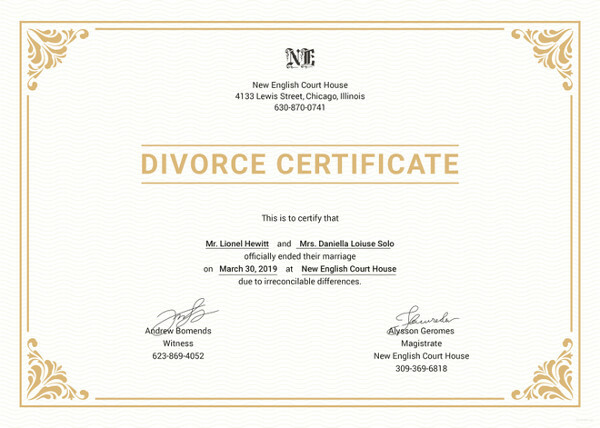 Need a divorce certificate translation? One of the most important documents that a person has is his or her divorce certificate. You can use it to show of proof of your divorce, apply for a travel visa, get a name change, get married, get a passport and many more in Australia and other parts of the world. The health department or bureau of vital statistics of the state issues these divorce certificates. This particular document usually has your date of divorce, your name, your former spouse and place of divorce. If your divorce certificate is in not in English, you need to have it translated first if you are planning on going to Australia. It is essential for you to find a reliable and experienced translator who is NAATI certified to translate your document. A single error could cost you a lot. If you choose OPAL Translation, you won’t have to worry about any of these. Our translators can complete your translation project fast with the highest quality for the lowest rates. Get a free quote on our divorce certificate translation services today. Just complete the translation quote and receive your exact quote in just 15 minutes. For divorce certificate translations, find a NAATI certified translator to handle your project. Australia has a high standard when it comes to translations. NAATI accredits translators and interpreters in the country. This is to make sure that all translations are accurate and of high quality. It is recommended that for any translation, look for a NAATI certified translator. This will help you avoid unnecessary rejection from any Australian authority. Try our NAATI certified divorce certificate translation services today. You won’t be disappointed. Our translators are all professional and NAATI certified so you can be confident that your translation is handled correctly. Expect to receive a high-quality translation when you order a translation from us. We have the most experienced and skilled translators when it comes to divorce certificate translation services. We have carefully handpicked the best translators in the country so you can feel at ease that your document is handled with care and expertise. When it comes to confidentiality, all of our translators are professionals. If you have any inquiry regarding our divorce certificate translation services, feel free to chat with our customer service representatives. They are always available to answer your questions. Check our affordable translations by completing the translation form. For as low as $69, you will receive a high-quality translation. However, the exact quote for your project will still depend on your document’s length, deadline and language. We do not just offer standard divorce certificate translation services. We also provide express divorce certificate translation services. Whatever your deadline, let us know, and we will complete your project on time. Want a free quote? OPAL Translation can provide you with one. Check out your document’s exact quote by completing the translation form on this page. Scan your document or take a clear photo of it and attach it to the form. One of our representatives will contact you in just 15 minutes to provide you with a quote. OPAL Translation has more than a hundred translators who are capable of translating from English to any of the following languages. How quickly can you translate my doc? We can complete your document in just 2 to 3 days via the standard divorce certificate translation services. Our express divorce certificate translation services, on the other hand, have a turnaround time of as fast as 24 hours. If you need a hard copy of your document, inform us early on, and we’ll post your certified hard copy once we finish your translation. Yes, you can. Save more time by ordering a translation online. You don’t need to come to our office anymore for a quote or order. Our staffs are always available to chat with you via the live chat. Also, we answer emails in just a matter of minutes. There’s no need for you to wait too long for our response. Order a translation today and receive it easy and fast! Want to order one of our divorce certificate translation services? Check the following steps to get your document translated today. Fill in the translation quote form on this page. Then, upload your document’s scan or photo using the form. We will send you a quote in less than 15 minutes absolutely free! That’s right. You don’t have to pay anything for a quote. Pay for your translation order. You can do so via bank transfer or credit. When your translation is complete, we will email you a draft of the translation and let you review the file. If you are satisfied with the translation, we will email you the final soft copy. If you need a certified hard copy, we will send it to you via Australian post. Do allow 3 to 5 days until you receive the hard copy. Order one of our divorce certificate translation services by simply following the above instructions. You’ll have your soft or hard copy in a few days after. Get a free quote today. Just complete the free quote form on this page and attach a scan or photo of your document. If you have any questions, email us or chat with us using the live chat below. We will answer you in just a few minutes.